How can you export the raw data from the platform? To help you be prepared for when you'd need to use the details of our app offline, be it in presentations or custom reports, we've enabled a few different export options, besides the automatically generated (weekly/monthly) reports. After the download is requested, you will be notified by email and in the platform as well. There's a report of all of the requested CSV exports in the Exports Dashboard - read more about it here. All exports are for the selected timeframe - the default selection being for the last 30 days. 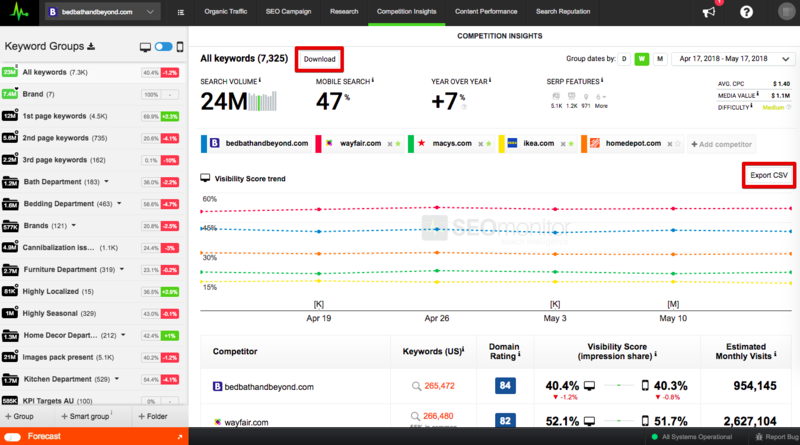 This will give you a summary of each campaign, with the number of keywords tracked, search volumes, set target percentage and the current Visibility Score. You can choose between one of the two types of files or a GSC data export. 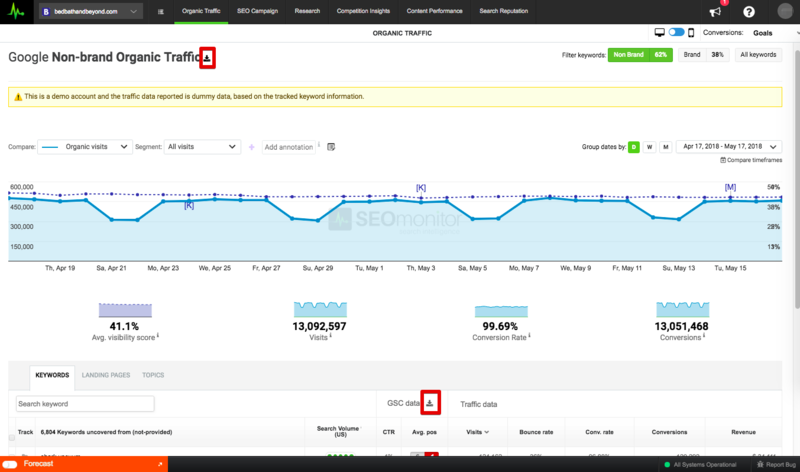 in the top statistics menu, over All keywords, in every group and on each individual keyword page. 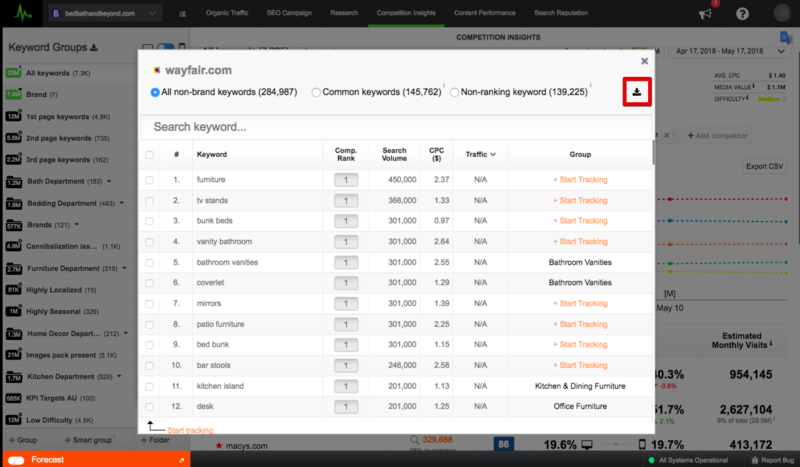 and for the Year over Year search trends, at a group or keyword level. 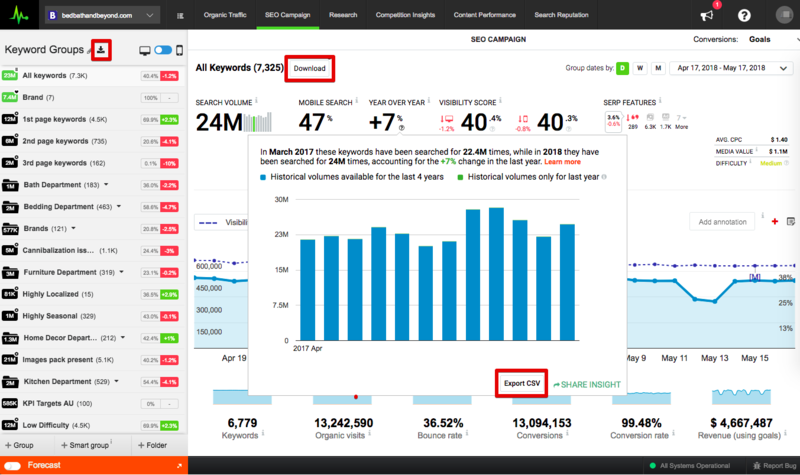 For the top menu for exports, you'll notice that you can also get a more detailed CSV, with all of the SERP details. 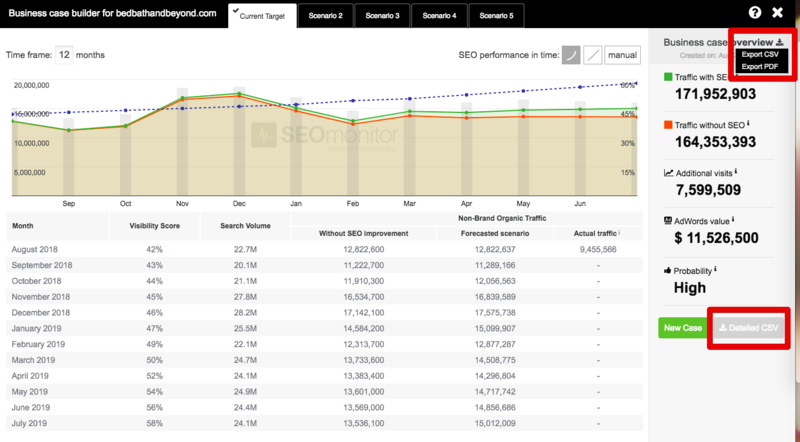 This includes the top 20 ranks for each keyword, with their landing pages, for each day of the selected timeframe. You can only export PDFs from this section. It provides you with all the details of your site’s activity in the selected timeframe. in the bottom right-hand side, you can get the CSV with that has all of the details, that only becomes available on a saved forecast. Both types of reports are available, as well as a detailed CSV. All options will appear on the right side of the screen. Another option of exporting raw data is directly through the API. It is available to all paying clients and you can read more about it in the API documentation. If you'd like to use Google Data Studio for processing the raw data, we've written a guide on how to do so here.